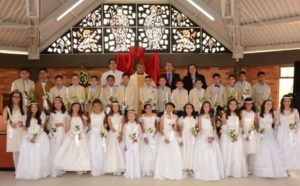 Colombia, the date was chosen for students — at two Viatorian schools — to make their first Holy Communion. Fr. Gustavo Lopez distributes communion to a first communicant at Colegio San Viator in Bogotá. 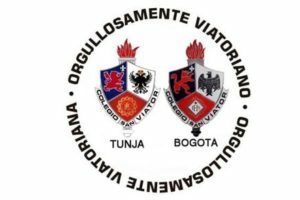 In Bogotá, where Viatorians have run Colegio San Viator for more than 50 years, Fr. 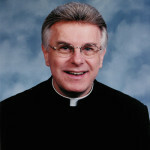 Gustavo López, CSV, chaplain of the school, celebrated the special Mass. In all, nearly 100 students received the sacrament, reflecting the size of the award-winning school. 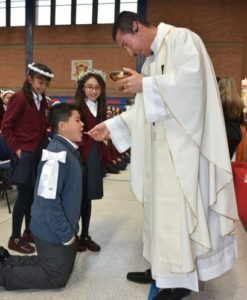 In all, nearly 100 students received their first Holy Communion at Colegio San Viator in Bogotá. At approximately the same time, 30 students at Colegio San Viator in Tunja received the Eucharist for the first time. Fr. Pedro Herrera, CSV, president of the school, presided at the Mass with Br. Juan Carlos Ubaque, CSV, assisting. Viatorians assumed control of the school in 2017, and since then its enrollment has grown significantly. Both liturgies took place Oct. 20, the day before the actual feast day of St. Viator, but its significance permeated the special ceremony. 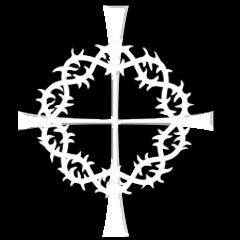 In recognition of the two Viatorian schools, working together to hold their first Communion Masses on the same day, school officials created a new logo, that features the crests of both schools, surrounded by the phrased, “Orgullosamente Viatoriano,” or proudly Viatorian.